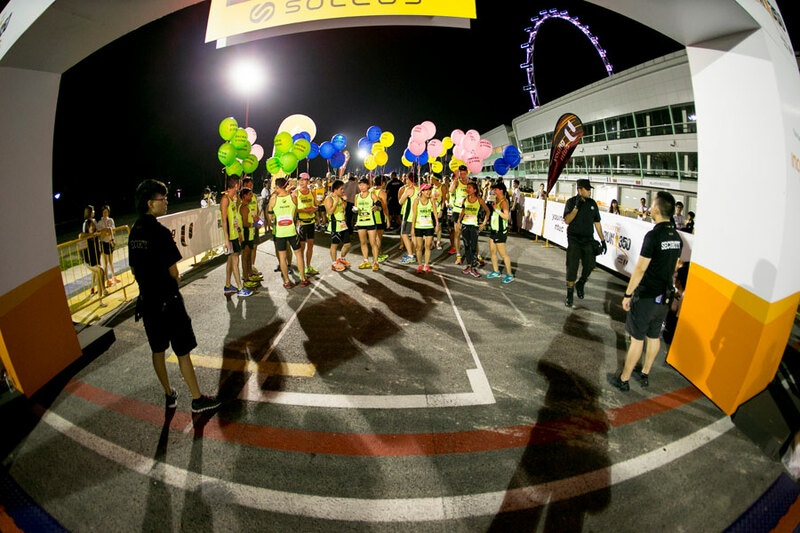 Race Review: NTUC Income Run 350 [10k] (by SinaiStrider) | JustRunLah! It’s sunday, it’s early and the alarm has gone off. It must be race day! 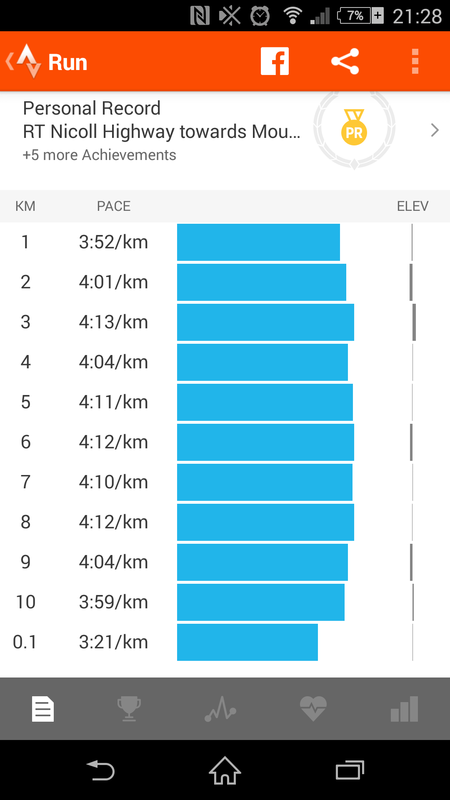 Here we go again, after a few weeks off to recover from my Translantau 50k Trail Ultra experience, I am back pounding the pavement over the shorter distances. 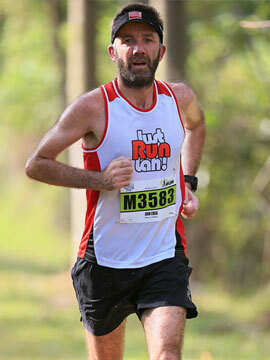 No 2XU last weekend, so this is the first race for me in a few weeks. I was away the week before with the family in Cameron Highlands, which was very cool and a great place to run, BUT, because it’s such a great place to run, my preparation for this 10k race wasnt exactly ideal. Wednesday, no run, Thursday 10k in the morning in Malacca and 9k in the evening in Cameron Highlands, Friday 14k trail run to the peak of Gunung Brinchang and back (2000m peak) and then Saturday driving back from Cameron to Singapore – 7 hours in the car, bed at approximately midnight, alarm set for 0500. hmmmm, not ideal at all. Anyway, I’ve raced after worse, so I’m just going to get on with it. 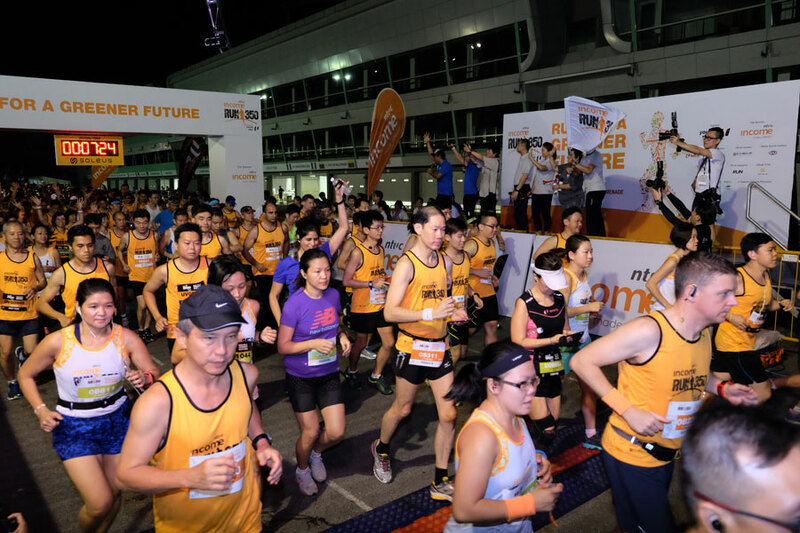 I drive in to town and park at Suntec – a short stroll over to the Pit Lane and I’m there in good time, the start pen for the 10k hasn’t opened yet and most people are just milling around waiting. I see Stu and we have a quick catch up. Not many of my usual buddies and opponents here today, maybe the long weekend has made this a less attractive option. The start pen opens and we head down the chute. I have a good position practically on the start line, Stu and I wait there chatting until the visiting dignitaries have done their bit and we’re off. One of the major plus points for me on this race is that the 21km has gone off in the opposite direction so there is no merging of distances which happens often in other races. Heading out with the leaders I have huge amounts of clear space around me almost from the first 500m and it makes for a relaxing run. In fact it’s almost too relaxing, the gaps between the person in front of me and the runner behind have opened up to about 500m after 3km of Nichol Highway and I dont overtake and am not overtaken for the rest of the race. In these situations you have to force your own pace, which is hard to do. It’s a sticky morning, which makes this task even harder. 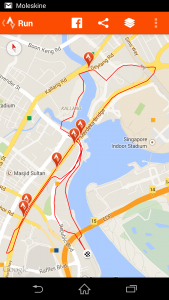 We loop back round the Old Kallang Airport and back over the Kallang river and onto the Riverside Path that takes us the final 3km to the finish. Here I encounter my only complaint about the whole event -marshalls not marshalling. I understand that mostly these are students, collecting extra credits, but it would be helpful if they did at least attempt to show you which way you are supposed to be running, particularly when there is no other runner in sight and you are hurtling towards a junction with three possible exits! So I have to ask a few times which way and eventually I get a response. It’s not a massive issue, but equally it’s not hard to anticipate that a runner might want to know which way they need to go and to just point in the right direction when someone is coming. 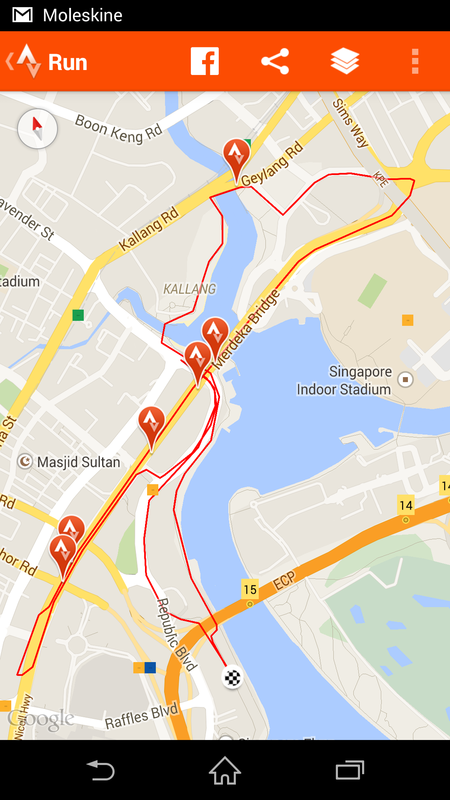 Through all of this I have kept a decent pace, but the humidity is making this a slower than normal race for everyone. I pick up the pace for the last 2-3km’s trying to catch Zhi Yong who is in the distance ahead of me, the gap has been consistent since about halfway, so we are running around the same pace now, despite my efforts I dont close the gap and he’s already finished when I turn into the pit lane. I pick up a final sprint and I notice that the ribbon is across the finish line. I’ve never run through a ribbon before, so it’s nice to do so with a load of photographers snapping as I finish. I catch up with Vanja (3rd Lady) and Zhi Yong (he’s in 8th place, I’m 9th) and we all head into the pit building for a 100plus and a banana. Unlike the marshalls, the Aunties manning the 100plus stand are wonderful, they applaud the three of us as we enter the building as if we have just won the race and it makes for a really great moment and a nice way to finish the event. After a brief cool down I wander back to the car and head home. 41:19, 9th place overall. 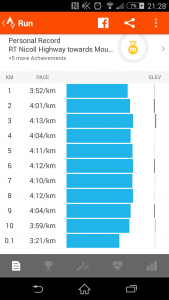 Considering the dodgy preparation and it being my first race since the 50k, I’m ok with the result – but there’s still work to do in the quest for the perfect 10k performance! 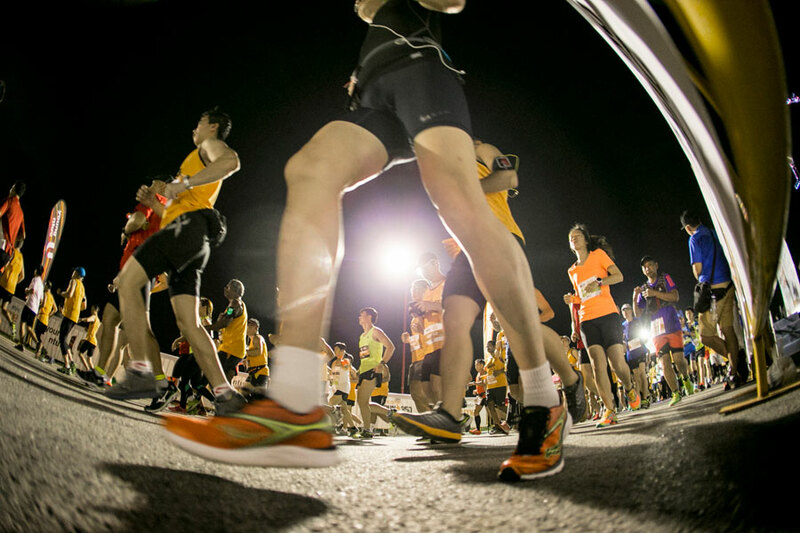 Next races for me: JP Morgan Corporate Challenge for the company team and then Energiser Night Trail. 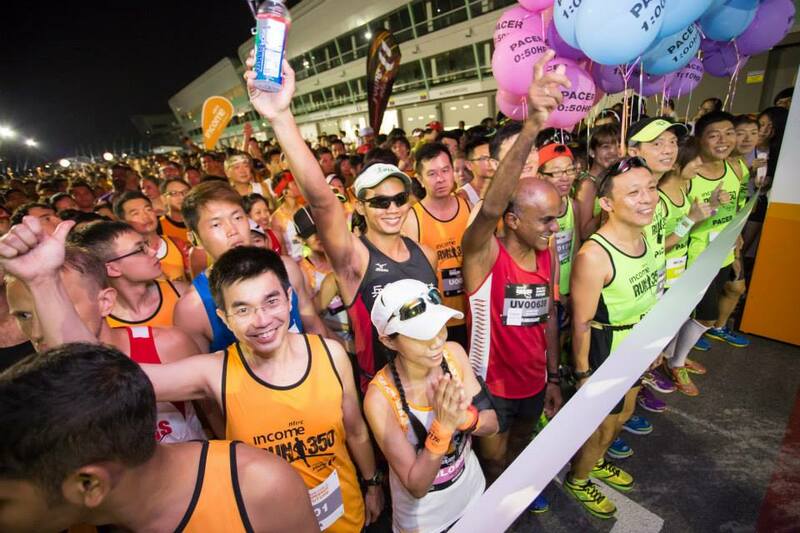 Click here for the photo gallery of NTUC Income Run 350 2015. Click here for more post from sinaistrider. Great run Jon! It’s nice to always see you at races. And I must agree the 10km race course was good with some manageable slopes even though I had to ask for directions at some points too. aiyo ! slowest lap pace is 4:13 !!! cheers Jason – a new blog post from you is well overdue my friend!